Happy Labor Day holiday, everyone! 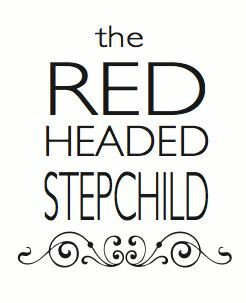 With any luck, you may be enjoying your day off by gathering with family and friends. It is, after all, the unofficial end of summer, so you might as well spend it at the grill, yes? And if by chance you are attending a cookout, oh boy, do I have the dish that you should bring to share. Actually, you should make this even if you are just grilling at home today. No, wait. You should make this no matter what. Even if you eat it sitting on the couch watching the House Hunters/Love It or List It marathon and it comprises your entire dinner and NO SHARING. What is this fantastic dish? Homemade guacamole! Not to be confused with holy guacamole, though the homemade stuff can be fairly magical. 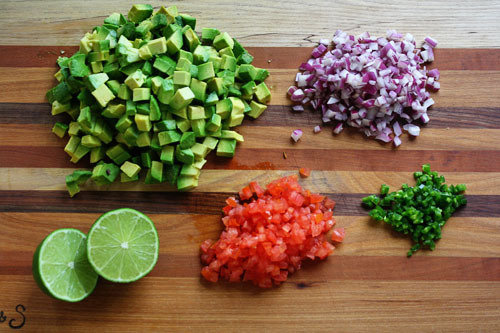 If you’re just feeding yourself and a family member or two, you’re gonna need the basic guacamole ingredients: an avocado, a quarter of a red onion, a quarter of a tomato, half a jalapeno (seeds removed), and a lime. If you’re feeding a crowd, you’re gonna need twice that... at least. Those are just the approximate amounts I use when it’s just Mr. P and me. And of course, it’s flexible. If you prefer a little more heat, add a little of the jalapeno seeds, or if you adore tomato or lime, use more of that. You know. SOME. But now listen up, because what I am about to tell you is very important. See, our friends in Nashville made THE BEST guacamole, and when we moved away from them, I mourned the loss of their delicious potluck offering. So I asked for the recipe, which they generously shared. And after reading it, I realized the crucial step that makes their guacamole THE BEST: they “cook” the onion in the lime juice. 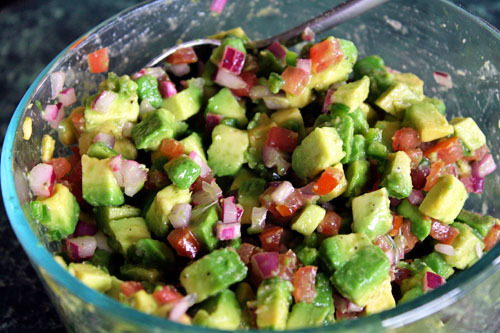 It takes away all the raw onion flavor and makes the perfect, THE BEST guacamole. 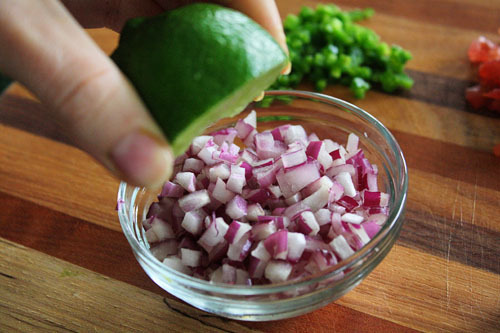 So rather than cut up all the ingredients like I did above, you should first cut up the onion, and then juice the lime over it. 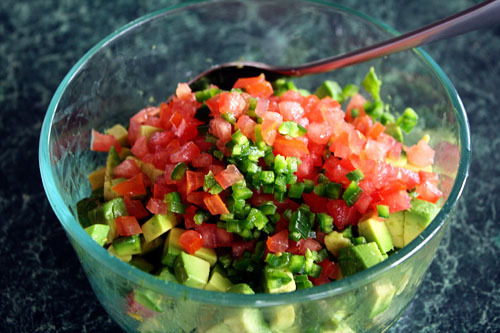 Then let it sit, just like that, while you cut up the avocado, the tomato and the jalapeno. Because Mr. P and I like chunky avocado and minced everything else (teensy bits of tomato, onion, and jalapeno), cutting everything else up can take a while. 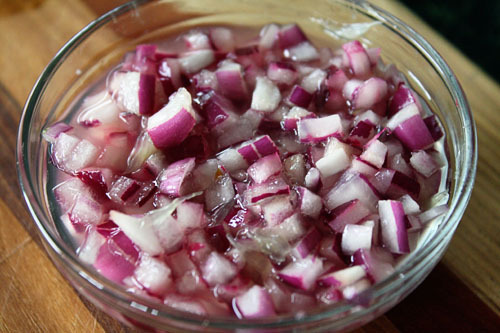 So, the minced onion usually marinates in the lime juice at least twenty minutes, if not longer. But oh, the difference it makes! Seriously, my friends are geniuses. Finally, season to your liking with salt, pepper, a bit of cilantro, or garlic – whatever you find in your pantry that floats your boat. Mostly I’m partial to a sprinkling of salt, just enough to “bring out the flavors”. You’re going to eat this with salty chips, though, so don’t overdo it! Then stir it all together! If you prefer mashed avocado, go for it, but we like it chunky. Besides, it all sort of melds together anyway, chunky or not! And there you have it! The perfect dish to send summer on its way! A delicious (and pretty!) 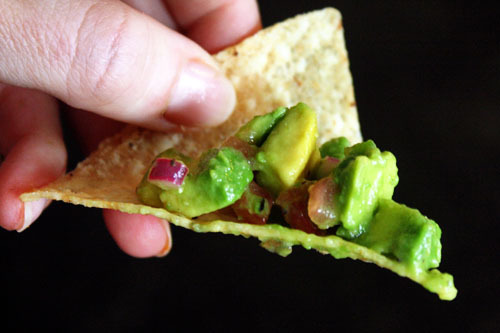 crowd-pleasing guacamole that beats store-bought every time! Be warned that it doesn’t keep well once mixed together, though, so you better be prepared to eat all that you make that day. And of course, you’re gonna have to use up the rest of the tomato and onion somehow... so you may as well buy a few extra avocados and limes, right? Which means you should just eat guacamole for dinner every night this week, I think. Enjoy! It's the Drs. W's trick! Of course MP would think of it, right?